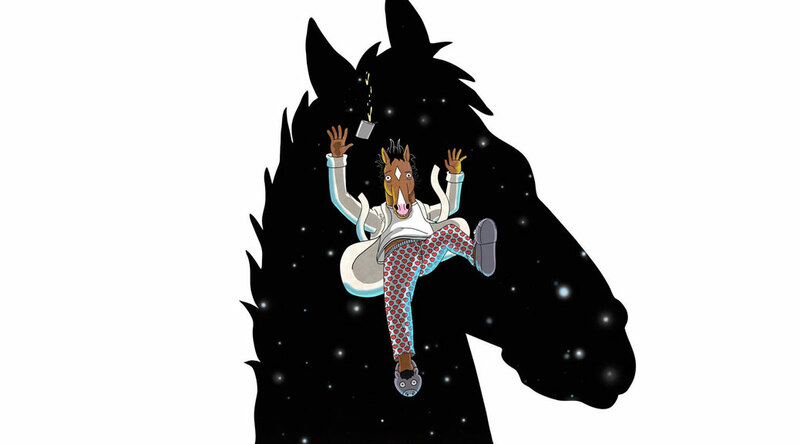 Bojack Horseman is an animated show in a world that is inhabited by both humans and anthropomorphic animals , starring Will Arnett as the voice of the titular character, that follows the adventures of former TV-star of the famous show Horsin’ Around as he deals with the fact that he’s become washed up and irrelevant. Fueled by self-loathing, alcohol and a mixture of drugs he sets out to reclaim the spotlight with a comeback. To help him he’s put together with a ghost-writer to help him put together his memoirs, as he drags his manager, room mate, and rival along on his egocentric ride of destruction. While it might seem like simple-minded show, the drama, emotions, conflicts and everyday-life for all involved is compelling and should appeal to anyone that likes character-dramas. The idiotic hijinks, satirical and parodical views on media, stardom, and corporate politics, and simply stupid jokes (such as my personal favorite: Neal McBeal the Navy SEAL that is a seal that’s in the navy), become supporting characters to the interaction between the main characters as they deal with each others personalities and demons.